Queen honeybee; Official State Agricultural Insect of Alabama Photo by John Brandauer/Flickr (Noncommercial Use Permitted with Attribution/No Derivative Works). Honeybees live in hives of up to 80,000 individuals. 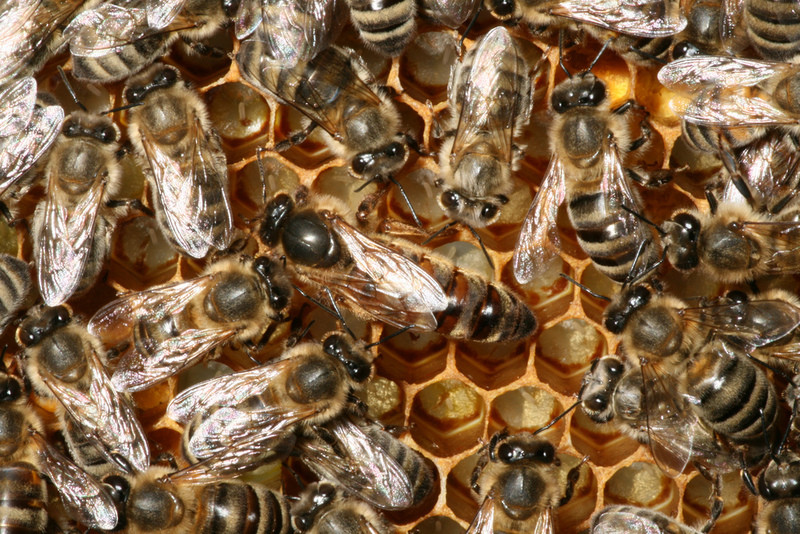 A hive normally consists of one queen bee (who can live 8 years and lay over 1,500 eggs per day - the worker honeybees feed, follow, and protect the queen), a small group of male drones to fertilize a new queen on her nuptial flight (should one be produced), and the remaining vast majority of sterile female worker bees. The first bees appear in the fossil record dating 40 million years ago and the honeybee has remained physically and socially unchanged for 30 million years. Probably originating in tropical Africa, they were brought to the New World with the first Spanish and English colonists, quickly escaping to the wild and eventually populating the entire western hemisphere. Native Americans called honeybees "white man's flies."